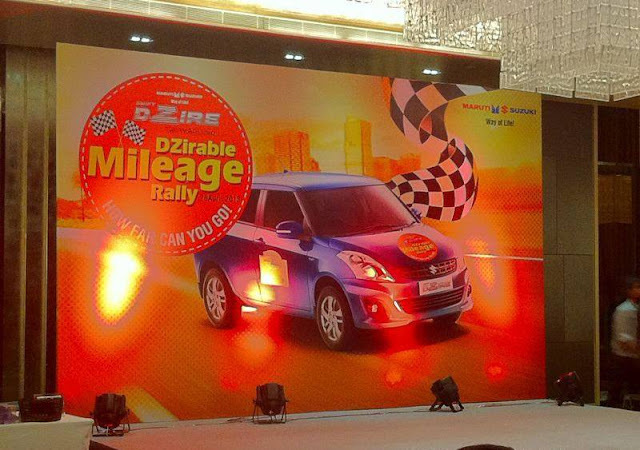 Maruti conducts campaign for Dzire to avert Amaze competition - registers 45.8 Kmpl mileage ! As expected from the market leader, Maruti Suzuki responded bravely to the intension competition started by Honda Cars India Limited by launching Amaze at same price levels as the market leader Dzire. The carmaker conducted a nation wide campaign named "mileage drive rally" across 31 cities in India. As per this rally, the customers were to drive the Maruti Suzuki Dzire for a distance of 70 Kms with a checkpoint after every 10 Kms. Following were the rules disclosed by Maruti Suzuki to persons driving during the rally. Avoid sudden acceleration / deceleration. Avoid stopping the car while in motion. Over 62 customers participated in mileage drive rally, however Mr. Gurdeep Singh clocked the best mileage figures of 45.8 kmpl in a diesel model, while Mr. Shrirang Chindarkar topped the petrol category with 42.1 kmpl. Interestingly, the average fuel efficiency in the city event was 30.6 kmpl for petrol and 32.4 kmpl for diesel. The certified fuel efficiency of Swift Dzire petrol is 19.1 kmpl and Swift Dzire diesel is 23.4 kmpl. Speaking on the occasion, Manohar Bhat, Vice President (Marketing), Maruti Suzuki India Limited said, "Competition is in all segment of the cars we sell. We welcome all competition. Our cars speak for themselves by their performance. We are celebrating the 5th year of the Dzire and so we thought of conducting such a mileage rally to connect with our customers," .